Rumour is the latest restaurant to open its doors in Missoula. It’s clubby in a New York chic meets Western Montana way. With an urban vibe, cowhide and leather seating, bar stools, comfy club chairs, dark hues and fireplaces, you can’t help but want to grab a cocktail and stay a while. John and Colleen Powers know the restaurant business and they have cultivated that knowledge to construct an inviting place to gather. They offer a full bar and an impressive wine list. Several seating areas, each with a slightly different feel, create intimate spaces for conversation. A large dining room sits adjacent to an outdoor patio. John noted that they paid special attention to soundproofing the walls – and we could tell. The ambient noise was just enough so that we could enjoy our meal without yelling across the table (which seems to be the new normal anywhere you go). Now, let’s talk about the menu. Whether you’re stopping by for brunch, lunch, happy hour, or grabbing dinner with friends, Rumour presents an eclectic selection of pizzas, pasta, steak, fish, and more. Their street tacos, listed as a house specialty, didn’t disappoint. We tried both the chicken and the pork options; each was served with housemade tortilla chips and salsa. Locally sourced beef and bison are featured on the menu as well. Try their fall-off-the-bone bison short ribs (one of John’s favorites) or prime rib (weekends only) with your choice of sauces. Rumour serves up several gluten free and vegetarian dishes including Farm Omelette Street Tacos and Avocado Sticks, as well as gluten free dessert options. Speaking of dessert… we couldn’t leave without tasting the white chocolate cupcake (okay, devouring) or the beignets with warm chocolate sauce. Unfortunately, the brownies had sold out long before we arrived. Another reason to go back! John tells us that Chef Nicholas Cebalo, one of Rumour’s Executive Chefs, knows his way around a kitchen. He started at the Ranch Club working as a dishwasher while he attended the University of Montana. Cebalo decided he wanted to work in the food industry and continued his education, earning a certificate from the Auguste Escoffier School of Culinary Arts, a French farm-to-table culinary school in Boulder, Colorado. He returned to Montana to work at the Rock Creek Cattle Co. and was recruited by the Powers to open the new restaurant. John and Colleen both make the rounds, visiting, checking on meals, and chatting it up. They welcome guests into their space; it’s what makes you want to go back. The casino is open during restaurant hours. A recent move to the Bitterroot Valley in Montana, just 25 minutes of south of Missoula, led me to the Mission Bistro in Stevensville. I’ve visited this little spot three times since New Year’s Eve and I just can’t get enough! Located at 101 Church Street – just a mile from Highway 93 just off of the Eastside Highway – you’ll find this brother and sister-run restaurant. Angie and Eric Loessberg, both from Stevensville, operate Mission Bistro. Eric is a professionally-trained chef and Angie has spent years honing her skills in front of the house operations. But, I must tell you about the food. Described as “Northwest cuisine with a touch a french inspiration…” there is something for every palate. With each visit, I’ve tried something new on the menu. First, it was a New Year’s Eve special. My husband and I decided to celebrate the New Year with a bottle of Balletto Russian River Pinot Noir (2012) and an inspired cheese plate served with local honeycomb, toasted Marcona almonds, and toasted slices of Le Petit baguette. Our entrees, filet mignon and lobster (holiday specials, not on the regular menu), were cooked and seasoned perfectly. Though we had little room for dessert, we indulged in a slice of homemade key lime pie. The second and third visits were for Sunday brunch, offered from 9 am to 3 pm. 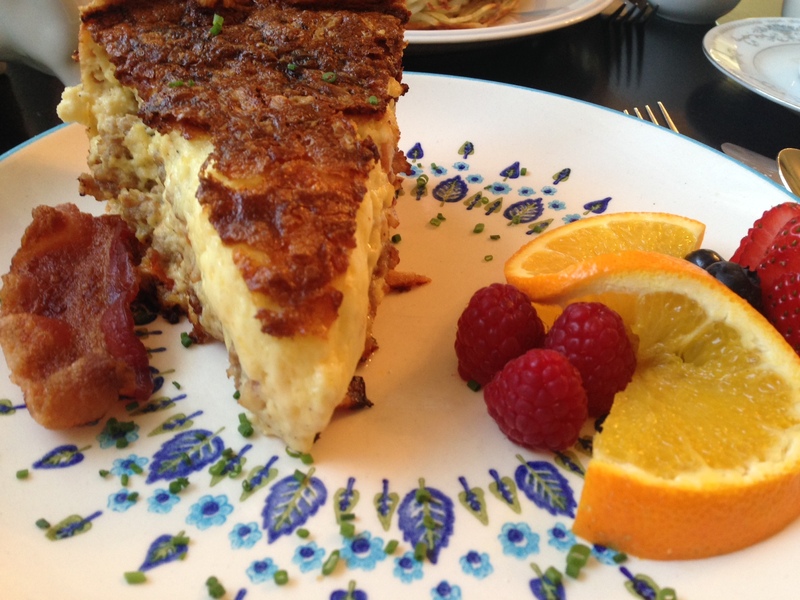 Mission Bistro’s brunch menu is both sweet and savory. In addition to what’s on the menu, they offer two quiches – one packed with seasonal veggies and cheese, the other with Kalispell-based Redneck sausage, bacon, and Lifeline Farm cheddar. Both excellent! Since we had ordered one of each quiche during our first brunch visit, my husband was eager to order off the menu. 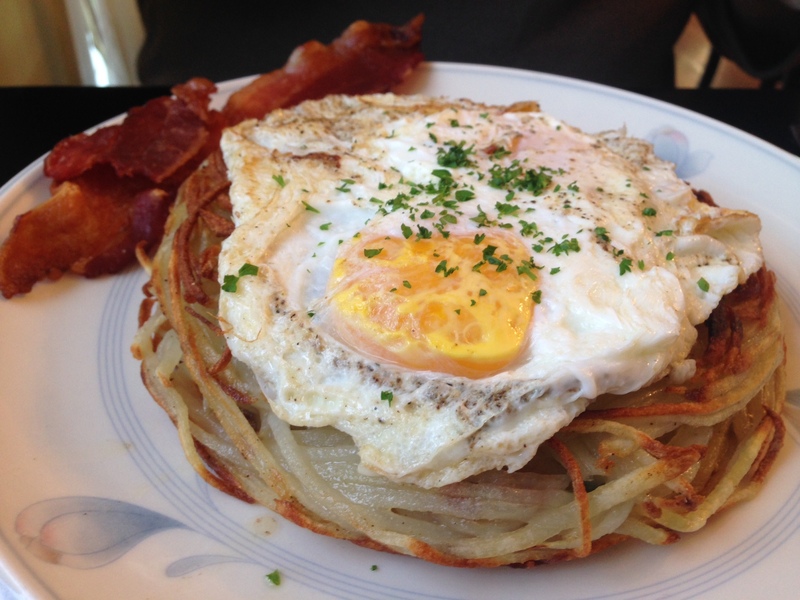 He tried the Stuffed Rosti Potato (pictured) and loved it – simple flavors, combined with great presentation. Mission Bistro also offers an assortment of homemade muffins and pastries. We tasted the apple turnover, banana chocolate chip muffin, and huckleberry orange muffin over the course of our two visits. All delightfully satisfying. Reservations are recommended, but not required (call 406-777-6945). There are three seating areas that fill up quickly, so I’d advise reservations unless you don’t mind waiting. Large parties can be accommodated. Mission Bistro is open Wednesday through Saturday from 5 pm to 10 pm for dinner and Sunday from 9 am to 3 pm for brunch. Please note that the restaurant is closed from January 26th – February 10th for a refresher after the holidays. The best ballet flat for travel! Napa Valley is the perfect place to spend an Anniversary…it’s the perfect place to spend any leisurely day really. I had just a few days to spend in a place I’ve looked forward to visiting for years. I mapped out an itinerary of wine tastings, restaurant stops, spa services, and a bit of downtime to celebrate 25 years of marriage with my husband. From Missoula, we flew into San Francisco, rented a car and drove about an hour to Napa. 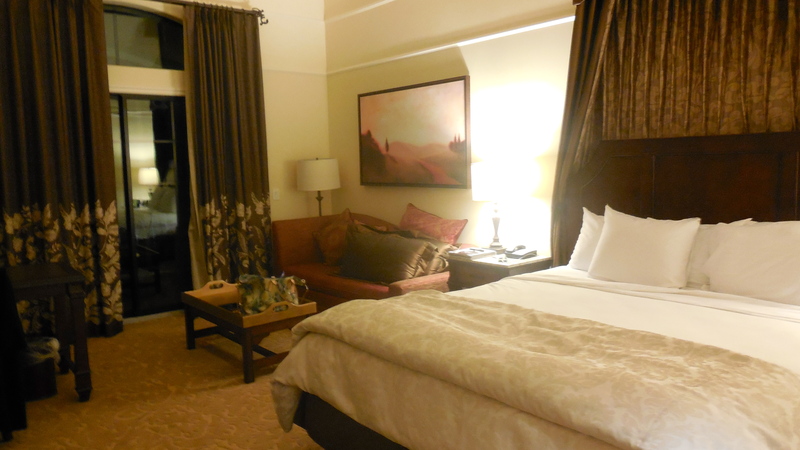 A luxurious room awaited us at The Meritage Resort & Spa. Now, our first approach into the resort wasn’t quite what we expected. As we turned into a Corporate Park, I began to wonder if I’d made a mistake. Not quite the vineyard setting I’d anticipated; however, my apprehensions were soon put to rest. The Meritage is a beautifully appointed property with spacious accommodations, attentive staff, and plenty to do on-site including Spa Terra, Trinitas Cellars for wine tasting, an adults-only pool and jacuzzi with bar service, outdoor fireplaces and seating, and an indoor bowling alley adjacent to their Crush Ultra Lounge. 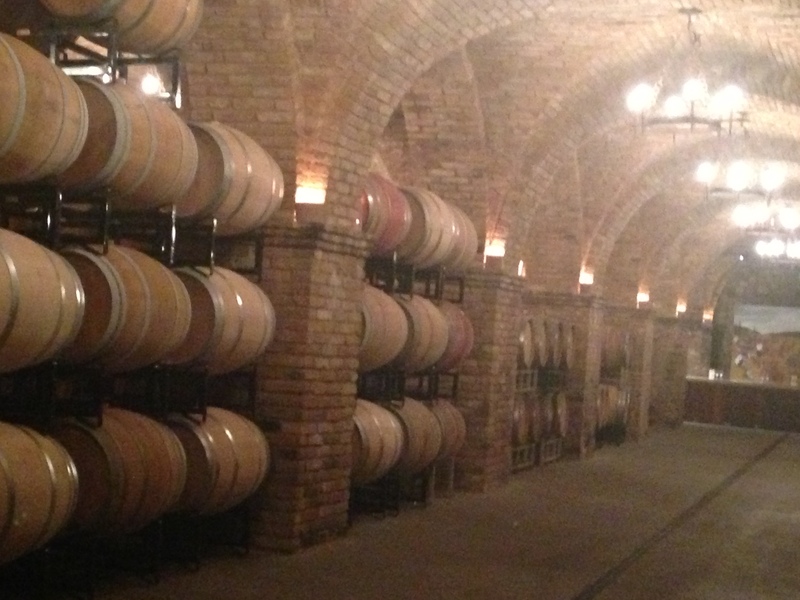 Napa has no shortage of fabulous world-class restaurants and we visited several during our stay. The Boon Fly Cafe is a must-visit. Try their number one seller: Jalapeno Eggs Benedict, with just enough spice to keep things interesting without overpowering the light hollandaise bath. And, try a mini-pail of their homemade, warm mini-donuts while you’re waiting for breakfast; if you’re really feeling adventurous, ask for a Bacon Bloody Mary. You’re on vacation, right? We visited mid-week, so our wait was short. If you visit on the weekend, be prepared to wait outside a bit for a table. You’ll be glad you waited. After breakfast, we worked our way up to Yountville for a quick stroll around the town’s abundant shopping district. Chef Michael Chiarello’s Bottega restaurant, bestowed with some impressive honors including Best Newcomer by Zagat, Top 10 by Forbes, Top 20 by Esquire, and Top 100 Bay Area by Michael Bauer, and his Napa Style shop are side-by-side in a fantastic setting. 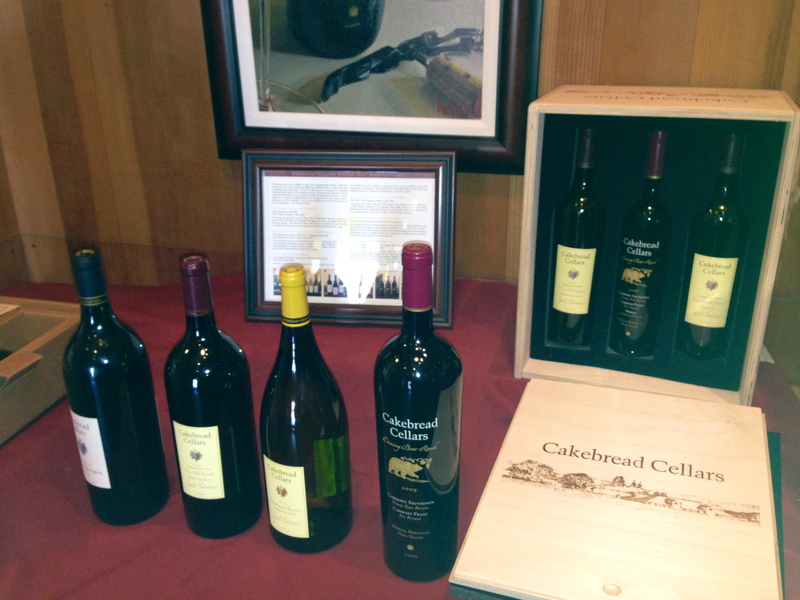 We continued up Highway 29 to Rutherford, California (just 10 miles or so up the road) to visit Cakebread Cellars for a Reserve tasting that included four of its reserve level wines in one tasting. Our engaging guide, Summer, poured Chardonnay Reserve from Carneros; a Cabernet Sauvignon from Napa Valley; a Vine Hill Ranch Cabernet Sauvignon from Oakville, Napa Valley and shared the origin of the name for the Dancing Bear Ranch at Howell Mountain. Curious to locate a wine we’d sampled on a recent trip to Santa Fe, we wound our way deeper into Rutherford to visit Round Pond Estate, owned and managed by the MacDonnell family, for a Barrel Tour & Tasting. We were not disappointed. 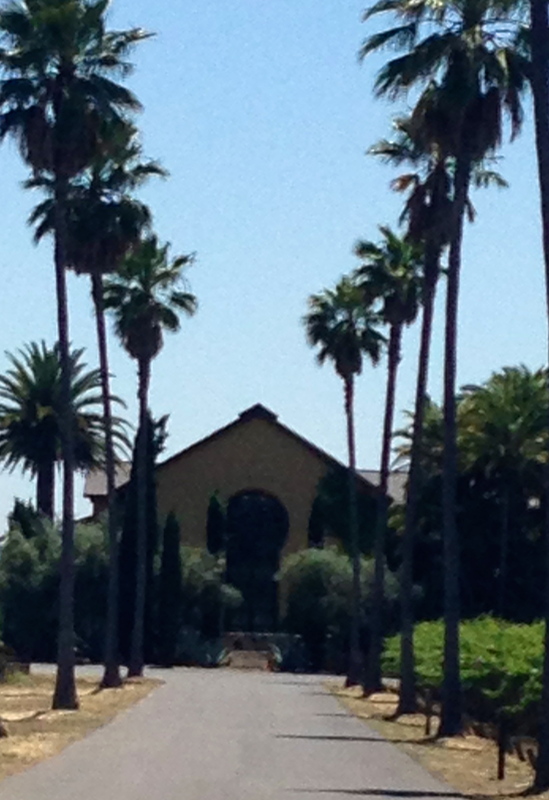 Round Pond’s long drive is framed by palm trees and grapevines – an impressive entry to an equally impressive property. With a unique mix of microclimates and soil composition near the Napa River, this land has proven to be an ideal valley for Cabernet Sauvignon, as well as Italian and Spanish olives. Our visit started with a sample of Round Pond’s crisp Sauvignon Blanc and a tour of the property, including a lush garden behind the winery, and the barrel room itself. 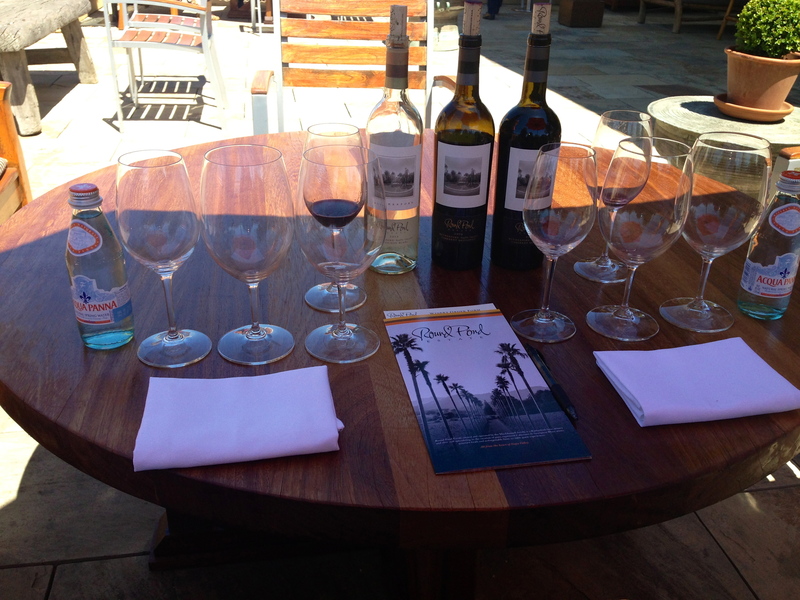 Following our tour, we were led upstairs to a welcoming terrace for a tasting of Round Pond’s 2009 and 2010 Cabernet Sauvignon and some small bites including Chef Eric’s Garlic Confit-stuffed Castelvetrano Italian Olives. We later returned to Round Pond to pick up an additional bottle of Cabernet and were treated to an impromptu demonstration of the Chef’s technique for making his stuffed olives (and a secret or two for preparing tender, braised game and pork). Round Pond also harvests olives and produces a variety of olive oils, including herb and citrus-infused oils. If that weren’t enough, they’ve created four robust red wine vinegars and two citrus syrups – Blood Orange and Meyer Lemon. My salads may never be the same! From there, we made our way back to Spa Terra at the Meritage Resort for an afternoon of relaxation with a couples Seduction Package, complete with champagne and chocolate. Is there a better way to spend an afternoon? Refreshed and relaxed, we ventured back out for dinner at Restaurant Cuvee in Napa. It’s an unassuming building from the outside, but the inside is a mashup of comfort food and specialty cocktails, soft and kitschy lighting. We sat in the outside courtyard near a glowing fire pit and soaked up the day’s experiences. Cuvee left us completely satisfied after a meal of Slow Braised Short Ribs and Pan Roasted Diver Scallops. Our waiter delivered the “Sugar Menu” and we couldn’t pass up a taste of their Hazelnut Pot du Creme and Chocolate and Pinot – a molton cake with roasted strawberries and a pinot noir syrup. 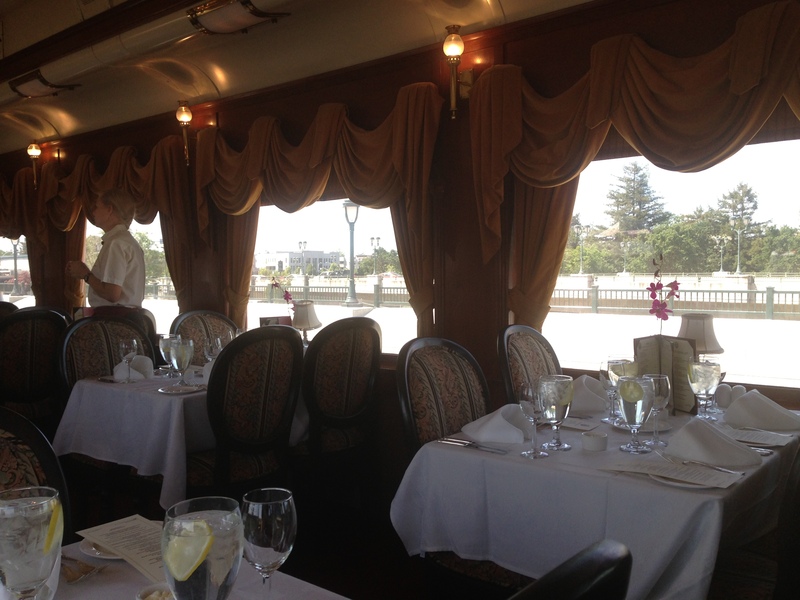 On the third day of our visit, we had reservations for the Napa Valley Wine Train. It was Memorial Day weekend, and packed with visitors, but the entire experience was orchestrated without a hiccup from boarding to the lunch service to the dessert car and our disembarkment to a coach that would take us to Calistoga for a tour of Castello di Amorosa. The Wine Train is a bit pricey, but it is an experience like no other. There were patrons dressed up in 1940’s style, complete with gloves and hats, and everything in between. Each couple is seated with another and we enjoyed the conversation with our Denver-based tablemates, while taking in the scenery and working our way through lunch. Once we arrived at the Castello di Amorosa, our group of 16 was escorted to a guide who led us through the castle with a delightful narrative of its history – it was purchased and built by Dario Sattui who also owns the V.Sattui Winery in St. Helena – and a tour of its long hallways, torture chamber, barrel room, and various tasting areas. Our tour was about an hour long followed by a 45 minute tasting of several current releases. We couldn’t help but order a few bottles to ship home – their wine is not currently distributed to restaurants or retailers; it’s available for purchase on premise or online. Our final stop that evening was dinner at the 2013 Michelin Guide-recommended Celadon in Napa, located in the Historic Napa Mill. I tried the Prickly Pear Margarita, which probably wasn’t an obvious pairing with macadamia nut crusted goat cheese, port-poached figs, apples and crostini, but no matter – it was all good! Our dinner was exceptional and the service equally so. It was the perfect ending to an amazing visit to Napa and the perfect opportunity to begin planning our return. Santa Barbara is the perfect place to spend a romantic day and explore the hidden gems in the hills as well as the downtown and coastal areas. Following our tour, we made our way to downtown Santa Barbara for a stroll through the shopping district before a spectacular dinner at Bouchon. The restaurant was filled to capacity, but not overwhelmingly noisy. Dinner service was impeccable, servers attentive and engaging. Bouchon’s entire menu is sourced with local ingredients whenever possible. I was smitten with the maple-glazed California duck breast and confit of thigh served with a succotash of sweet corn, fava beans, applewood-smoked bacon, Windrose Farms butternut squash, and a port-thyme demiglace. Bouchon’s wine list includes some of the finest locally-produced Chardonnay, Pinot Noir, and Syrah. Our sommelier was happy to provide recommendations for our dinner selections. If you have more than a day to spend, Santa Barbara has many special offers available: free museum admissions, package deals, two-for-one wine tastings, tour offers, and many more complimentary perks – these are just some of the offers that will help you experience The American Riviera® first-hand. Be sure to check here for details. Oooo… one of my favorite food bloggers, Deb Perelman of Smitten Kitchen, has released a new cookbook and I can’t wait to begin devouring every delicious recipe! According to Amazon’s book description, Deb founded her award-winning blog, Smitten Kitchen, on the premise that cooking should be a pleasure, and that the results of your labor can—and should—be delicious every time and she has dedicated herself to creating and finding the best of the best and adapting the recipes for the everyday cook. There are 105 recipes and over 300 photos in the book, lots of stories and according to today’s Smitten Kitchen post, a cookbook that stays open on your kitchen counter when you want it to! Book tour details are below if you want to pick up your own signed copy! Los Angeles : FRIDAY, NOVEMBER 2nd, 1:00 p.m. Cooking demo + book signing. Please note: To have a book signed, a purchase of at least one book will be required in-store. Napa Valley: SATURDAY, NOVEMBER 3rd, 1:00 p.m. Cooking demo + book signing. Please note: Cooperfield’s would love if you’d consider buying a book for signing in their wonderful store, but it is not a requirement. Special presentation + book signing. Please note: Omnivore would prefer that you buy any books you’d like signed in their wonderful store. Please note time change; it will be one hour earlier to make sure I have as much time as possible to hang out before heading to Santa Cruz! Santa Cruz: SUNDAY, NOVEMBER 4th, 7:00 p.m.
Short talk + Q&A + book signing. Please note: Everyone will be able to get their books signed but those that buy them at the store will have priority order during the signing portion. Portland: MONDAY, NOVEMBER 5th, 7:30 p.m.
Short talk + Q&A + book signing. Please note: Powell’s does not mind if books purchased outside the store are signed during the event, however, those with outside books will be asked to stop at the info booth on their way in for a pass, so as not to raise security concerns. Vino Cotto di Montillo is my newest discovery for adding a little burst of flavor to all sorts of dishes. It’s a naturally-sweet “cooked wine” syrup that contains no alcohol or vinegar, no high-fructose corn syrup or artificial sweeteners, and no sugar. In fact, nearly three pounds of wine grapes are used to produce one 8.5 ounce bottle. I recently drizzled it over antelope chops while they were cooking and it served as a delicious, slightly sweet glaze. Later, I tried a splash over a scoop of dark chocolate gelato and in both cases it added a fantastic depth of flavor. Go to Vino Cotto to learn more or order your bottle. This would also make a wonderful holiday gift! Vino Cotto is a family-owned and operated company located in Framingham, Massachusetts. The Montillo family has been producing this delightful syrup in Calabria, Italy for over 100 years for personal use and began to produce it commercially in October, 2008. The Best Cafes in NYC – Culture-ist. A Box of Fun for Everyone! You may not have noticed, but there’s a new trend in town: subscription product boxes. Blissmobox, Julibox, Knoshbox, Birchbox, Glossybox™, and Bulubox™ are some of the subscription services that have popped up in recent months. Each month, a new box is delivered to your door containing sample products and some full-sized products, depending on the subscription service. I’ve subscribed to all of the services above, to see what each has to offer. Most offer a low subscription fee – between $10 and $40 per month, depending on the company and free or nominal shipping. Blissmo’s basic subscription is $19.95 per month plus $4.95 for shipping. I’ve received several months’ worth of boxes from Blissmo and love this service. Each month, subscribers have the option to choose from one of three themes: food, personal/beauty, or seasonal (some months even include an option for doggie products, mens’ boxes, or cleaning products). Subscribers receive a curated box of organic, non-toxic and eco products. Blissmo also offers some fantastic Office Break boxes. Blissmo packs each box with $20-$40 worth of products. 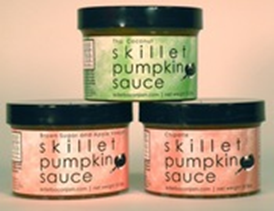 My October Knoshbox contained some fabulous finds including Skillet Pumpkin Sauce from Skillet Street Food in Seattle – a product I might not have otherwise sought out. Other goodies included Nate’s Happy Jack Pumpkin Granola from New Haven, Connecticut and Redhead Bacon Peanut Brittles, created by chef Meg Grace Larcom, co-owner of the redhead® restaurant in the East Village of Manhattan in New York City. A Knoshbox subscription runs $30 per month and shipping is free. Birchbox features well-known brands such as Kiehl’s®, Stila, and Smashbox® and offers free shipping on orders over $50. A monthly subscription costs $10. Bulu Box is a monthly subscription sample box containing four to five premium vitamin and supplement nutrition samples, also for $10 per month, delivered to your door. Each Bulu Box contains a mix of products for both men and women, including vitamins, supplements, sports nutrition, meal replacement, diet, energy, protein, detox, digestion, sexual health, herbs, natural remedies, endurance and more. Julibox was recently featured on the Today Show and I can hardly wait for my November box to arrive to try them out! Each month, subscribers are introduced to two great cocktails, curated by Julibox mixologists and designed for easy home preparation. Julibox provides the recipes and ingredients to make two of each cocktail – four cocktails total, complete with spirits and mixers. I can’t think of a better way to build a collection of spirits and recipes at home, not to mention an excellent reason to invite friends over to join in the fun. They’ll even email you in advance of your shipment to let you know if you need to grab any fresh items to embellish your cocktails (lemons, limes, etc.). A Julibox subscription costs between $36 and $40 per month, depending upon the type of subscription selected. A Glossybox subscription runs $21 per month (with discounts offered for longer-term subscriptions) and delivers a box of five luxury travel-sized beauty products for subscribers to lather, blend, soak, spray, buff, and groom. Products from October’s SpaLuxe box included Carol’s Daughter Shea Soufflé, Nastassja Skin & Wellness Enzyme Facial Peel, Heartland Fragrance Co. Loofa Soap, basq skin care Calm Resilient Body Oil, ModelCo LIP DUO Lipstick & Ultra Shine Lip Gloss, and Alterna Professional Haircare BAMBOO Luminous Shine Mist. I live in an area of the country where shopping is limited to a couple of local department stores, Target, and a handful of locally-owned boutiques, which is nice in some ways, but also limits my sense of experimentation with new products. Now, for things like spirits and food, we do have some pretty fantastic options, but I appreciate a service like Julibox, which does some of the homework for me. Many of us pack a lot into a week with work, kids, family, and other obligations, so it’s nice to “try on” products that we may not have the time to seek out – or otherwise have access to.